Chronicles of Nushy: [Lifestyle] Finally upgraded the shaver! Yes, the shaver!!! [Lifestyle] Finally upgraded the shaver! Yes, the shaver!!! You'd be wondering what's there to talk about it. If you know me, you know that I would upgrade everything quickly because I like to play with new stuff all the time. But I haven't bought a new razor in a while. In fact, I've had the same razor for the past 9 years!!! Would you believe me? That razor was special. It was a gift from a friend. It was a Schick Quattro 4, a massive upgrade over the simple two blade Bic razors (read: piece of crap razors) I had been using before I got it. It was from Australia. Schick was not available in Sri Lanka so I had to use the cartridges sparingly. When my friend visited Sri Lanka a second time, I got few more cartridges and after a while I came to Japan. Schick is a popular brand in Japan. I bought many cartridges and used the razor during the entire 3 1/2 years I've been living in Japan. 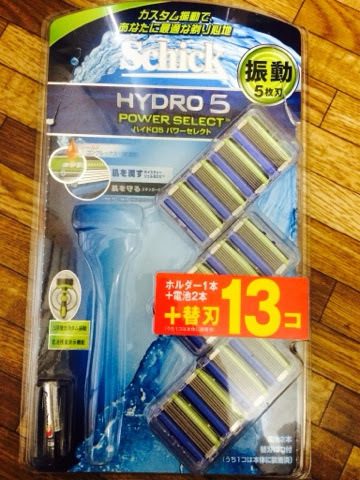 When I visited Sri Lanka, I took the Schick Hydro 5 for my father. It could vibrate the cartridge using the battery inside. That allowed you to get a better cut. The last set of cartridges that I bought were not good quality. I got razor burns often. And they got blunt quite quickly. The pad just before the blades that lubricated the skin also got deteriorated quickly. Few weeks ago we went to Costco and there they had the Hydro 5 Power Select (means, the cartridge vibrate) with a pack of 12 additional cartridges (there's one that's already fitted on the razor) for a reasonable price. I cannot remember the price though. I thought about whether to buy it or not for a while and finally decided to buy it. Yesterday I started using it for the first time. Man, what a difference!!! The new one gives a great cut. They glide so easily as well. I don't get a razor burns anymore. It also takes less time for the shave because it does a clean cut quickly. I was so stupid not to have upgraded the blades sooner. The only problem I have with it is that it doesn't come with a razor holder. The old one - the Quattro 4 - had a holder. Perhaps they offer a holder for the Hydro 5 as well, but I didn't get one with the package I bought.